One of the milestones of the science of light commemorated during this International Year of Light and Light-based Technologies is “the embedding of light in cosmology through general relativity in 1915,” that is, the celebration of the centenary of Albert Einstein’s general theory of relativity. As Adolfo de Azcárraga, president of the Spanish Royal Physics Society (RSEF), points out in his book titled Albert Einstein, His Science and His Time, Einstein’s theory contained a spectacular prediction: “light also possessed ‘weight’, i.e., it should be attracted and deflected by celestial bodies.” Since the equivalence between acceleration and gravity extends to electromagnetic phenomena and light is an electromagnetic wave, light rays should bend in the presence of a gravitational field. Einstein had already realized that the only way to experimentally verify this theoretical prediction was for a total solar eclipse to take place since this would make it possible to photograph a star near the Sun when observed from Earth without the presence of strong sunlight. Well, on May 29, 1919 there would be a solar eclipse, which would be total on some parts of the Earth’s surface and would make it possible to verify that light rays are bent by gravity. In order to check the deviation of light rays due to the presence of a gravitational field, two British scientific expeditions were organized. Both expeditions emulated the expeditions during the eighteenth century made by Malaspina, Cook or La Perouse, the Challenger expedition or Darwin’s voyage aboard the Beagle in the nineteenth century, as well as the British Antarctic expedition of the early twentieth century, known as Discovery, where leading figures in the Heroic Age of Antarctic Exploration, including Robert Falcon Scott who led the expedition, and Ernest Shackleton participated. Frank Dyson was responsible for organizing two parallel expeditions, each of which would go to a point near the Earth’s equator. The eclipse was not visible in Europe and although it could be seen as a partial eclipse from most of South America and Africa, it was only a total solar eclipse if seen from locations on a narrow strip beginning at the Pacific Ocean, and crossing Brazil, the Atlantic and Equatorial Africa to the Indian Ocean. The expedition led by Charles Davidson headed to Sobral, on the northeast coast of Brazil, and the other led by Arthur Eddington went to the island of Príncipe, at that time Portuguese colonial territory, in what is now a small country called São Tomé and Príncipe in the Gulf of Guinea. Eddington’s base was in the cocoa plantation at Roça Sundy. The two expeditions left the UK in March and arrived at their destinations in good time to make all necessary preparations for a correct observation of the total eclipse. The eclipse lasted 6 minutes and 51 seconds, one of the longest in the twentieth century. During the eclipse, many photographs of stars around the Sun’s corona (which normally would not be visible because of the strong sunlight) were taken and for whose further study, several months were needed. Eddington was responsible for the analysis of the data collected on the island of Príncipe, while Dyson was responsible for the data from Sobral. 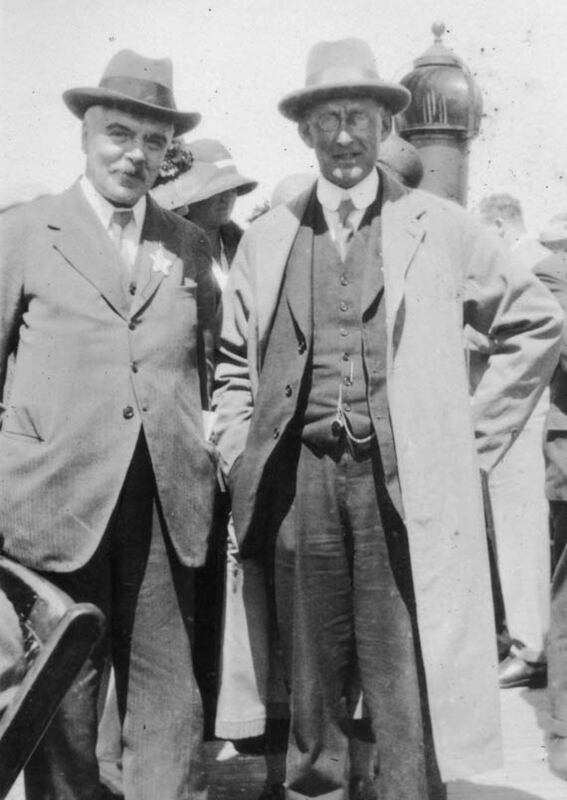 Frank Dyson (left) and Arthur Eddington (right). Credit: AIP Emilio Segrè Visual Archives, W. F. Meggers Collection. According to the theory of general relativity, light rays passing near the sun should deviate slightly because light is bent due to the gravitational field of the sun. This effect can be observed experimentally only during eclipses, because at other times the brightness of the Sun obscures the light emitted by these stars. The actual and apparent positions of about thirteen stars were compared and the conclusion was unequivocal: analysis of the measurements of the light ray deviations confirmed that the gravitational field of the Sun exerts an influence on light, as predicted by Einstein’s theory. One of the most spectacular theoretical predictions ever made had been verified just four years after it had been put forward. The physicist, mathematician and science writer Joseph P. McEvoy, in his book Eclipse (The Science and History of Nature’s Most Spectacular Phenomenon) published in 1999 states that «a new theory of the universe, the brainchild of a German Jew working in Berlin, was confirmed by an English Quaker on a small African island.» Eddington considered his verification of the deflection of light, which he glimpsed via an early analysis of his plates while still on Príncipe, the greatest moment of his life. Both the expedition to Sobral and that to the island of Príncipe, together with the results obtained from the measurements taken during the total solar eclipse of May 29, 1919, crossed not only geographical borders but also the cultural borders between scientists and the general public, and catapulted Einstein to worldwide fame. A star had been born thanks to the measurement of the deflection of light from other stars. A. Azcárraga, En torno a Einstein, su ciencia y su tiempo (Publicaciones de la Universidad de Valencia, 2007). A. S. Eddington, “The total eclipse of 1919 May 29 and the influence of gravitation on light”, The Observatory, Vol. 42, p. 119-122 (1919). W. Dyson, A. S. Eddington, C. R. Davidson, “A Determination of the Deflection of Light by the Sun’s Gravitational Field, from Observations Made at the Solar eclipse of May 29, 1919”, Philosophical Transactions of the Royal Society A 220 (571-581): 291–333 (1920). D. Kennefick, “Testing relativity from the 1919 eclipse—a question of bias”, Physics Today 62(3), 37 (2009). R. Ellis, P. G. Ferreira, R. Massey and G. Weszkalnys, “90 years on — the 1919 eclipse expedition at Príncipe”, Astronomy & Geophysics 50 (4), pp. 4.12-4.15 (2009). C. el Puerto, “La utilidad de lo inútil. La Relatividad General”, IAC, Vía Láctea, s/n, El Blog, 19-08-2014 (consultado el 28-05-2015). J. P. McEvoy, Eclipse: The Science and History of Nature’s Most Spectacular Phenomenon (Fourth Estate Ltd., 1999).